LibCal makes it easy to create custom booking forms. Thanks to the Question Bank, you can create a question once and reuse it in any number of question forms. This is great for common questions you ask multiple times, such as a patron's phone number, ID number, or status, since you won't have to recreate that question over and over for each new form. Plus, when you make a change to a question, it'll be reflected in every form where it's being used. Head to Admin > Equipment & Spaces > Booking Forms. If you don't see the Admin menu, you are not an Admin level user in your system. In the Question Bank panel, click on the Add New Question button. In the Add New Question window, enter the label for your question in the Text field. Choose the Type of question you want to add. 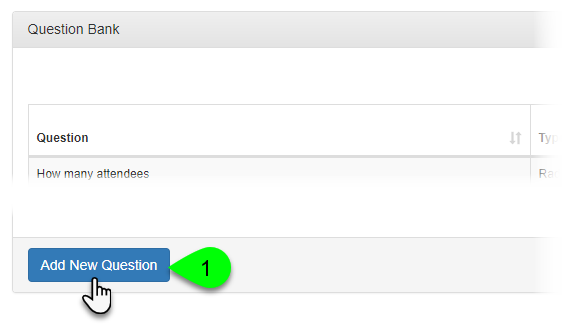 Optionally, select the Required checkbox to make the question required. 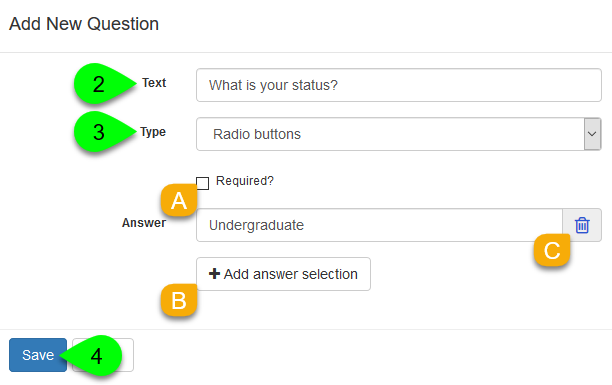 For Radio Button, Checkbox, and Dropdown questions, click on the Add answer selection button to add a new multiple-choice option. To delete an answer from a Radio Button, Checkbox, or Dropdown question, click on its Delete () icon. To edit a question, click on its Edit () icon in the Actions column. To delete a question, click on its Delete () icon in the Actions column. You can only delete questions not currently in use by any question forms. NOTE: when you delete a question, you will permanently remove all of its responses from your booking data -- so be careful!